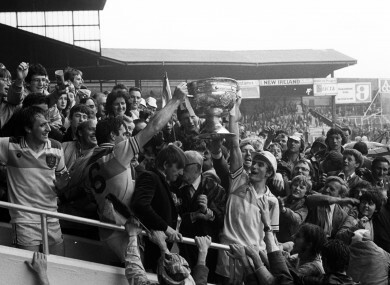 Offaly players celebrate their 1982 All-Ireland final victory. DUBLIN’S ATTEMPT TO complete the five-in-a-row will be one of the dominant themes of the 2019 Irish sporting year and a new documentary this Christmas will look back at the famous final when Kerry chased that accolade against Offaly in 1982. Players Of The Faithful will air on RTÉ One on Friday 28 December at 9.30pm and will tell the story of the Offaly team that ended Kerry’s hopes of clinching Sam Maguire glory for the fifth successive year. Brothers Matt and Richie Connor in Tullamore, goalscoring hero Seamus Darby in Toomevara and the New York-based pair of Martin Furlong and Gerry Carroll are the winning players who delivered their recollections. The documentary is produced by Loosehorse, who were responsible earlier this year for Micko and last year’s Blues Sisters, and here’s the trailer they have released. Email “New documentary to look back at Offaly's famous All-Ireland win that ended Kerry's five-in-a-row dream”. Feedback on “New documentary to look back at Offaly's famous All-Ireland win that ended Kerry's five-in-a-row dream”.